This will prevent The Apocalypsies from sending you messages, friend request or from viewing your profile. They will not be notified. Comments on discussion boards from them will be hidden by default. 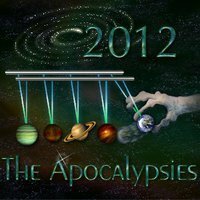 Sign in to Goodreads to learn more about The Apocalypsies. We’d love your help. Let us know what’s wrong with this preview of Unraveling by Elizabeth Norris. We’d love your help. Let us know what’s wrong with this preview of Devine Intervention by Martha Brockenbrough. We’d love your help. Let us know what’s wrong with this preview of Way to Go by Tom Ryan. We’d love your help. Let us know what’s wrong with this preview of Keeper of the Lost Cities by Shannon Messenger. We’d love your help. Let us know what’s wrong with this preview of What Happens Next by Colleen Clayton. We’d love your help. Let us know what’s wrong with this preview of Fair Coin by E.C. Myers. We’d love your help. Let us know what’s wrong with this preview of The Boy Project by Kami Kinard. 2012 debut authors of books for children and young adults. Take a look at The Apocalypsies’s Year in Books. The good, the bad, the long, the short—it’s all here.